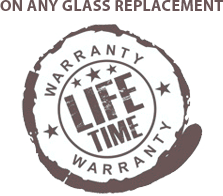 We offer a no quibble LIFETIME Warranty on our Glass and Workmanship, throughout the life of the vehicle while the vehicle remains in the ownership of our customer, as per our invoice. However, if it is found that there is vehicle deterioration, corroded or faulty in any way preventing ‘the Company’ from completing the work to our full satisfaction and high standard, we will not be able to offer any warranty. Replacement windscreens are guaranteed against intrusion of water only if Rubbers, Channels and bodywork are not deteriorated or corroded making sealing/resealing ineffective. Customer own supplied glass/parts will not be warranted, only the process which ‘the Company’ provides is warranted. NOTE: All Warranties are void if the vehicle is worked on by any third party other than ‘the Company’ or unless authorized by the management of ‘the Company’. Any account outstanding beyond our credit terms of 30 days, payable at the date of invoice (this is noted clearly on our invoice) maybe will be passed to our Debt Collection team or our Company solicitors and will be subject to a surcharge of £50.00 to cover the cost incurred. Such accounts will also be subject to any other costs incurred by ‘the Company’ in obtaining total outstanding settlement. A charge of 4% (four per cent) above Bank of England’s base rate, per month will be made to this invoice if not paid within its due date. ‘The Company’ reserves the right to vary the rate of interest charged. All goods and repair/services parts will remain the property of ‘the Company’ until the full purchase price has been paid.’The Company’ will reserve the right to remove our goods (glass, parts. etc) if unpaid, beyond 60 days. These Terms and Conditions of our Business are not intended to restrict or exclude any legal rights bestowed or implied by law or a consumer’s statutory rights under the sale of Goods Act 1979 or the Unfair Contract Act 1977 or any amendment thereof.